Cash Prizes, medals, certificates and more surprises await the runner. a. Participants below 18 years old must have their entry form signed by their parent/guardian. b. Participants shall ensure that they are physically fit to participate in the run safely. c. Race bib must be worn at all times during the race. It should be pinned in front of your running shirt. d. All protest related to the results must be made in writing and submitted to the Race Organizer within 30 minutes after the official announcement of winners. e. Organizers has the right not to allow nuisance participants and has a tendency to violate rules and regulations. f. Organizers reserve the right to remove any participant deemed physically incapable of continuing the race. h. No race bib, no entry. i. The Organizer’s decision is final. j. 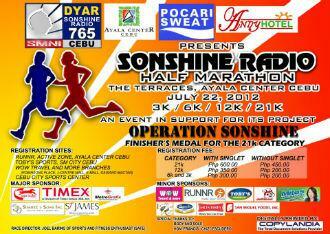 Foreign / Professional Runners may join to show their support for the OPERATION SONSHINE project but would be disqualified from the cash prize.